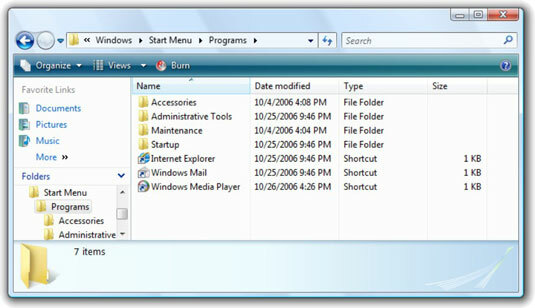 To make the Windows Vista Start menu really work for you, you need to understand the All Programs submenu. 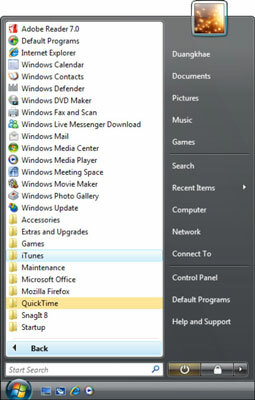 This may come as a shock, but the All Programs submenu on your Start menu doesn’t actually contain all the programs on your computer. (That explains why you can’t always find the programs you’re looking for.) If you want to make your All Programs submenu easier to use, you need to understand how Vista puts this list together. So, for example, if you’re logged on as the user Duangkhae, every time you choose Start→All Programs, the menu items you see come from the four folders, with Duangkhae substituted for <username> in the final two. Let’s look what you have in these folders. Right-click the Start menu and choose Explore. Vista opens Windows Explorer at your <username>AppDataRoamingMicrosoftWindowsStart Menu folder. If you right-click Start and choose Explore All Users, you’re magically transported to ProgramDataMicrosoftWindowsStart Menu. 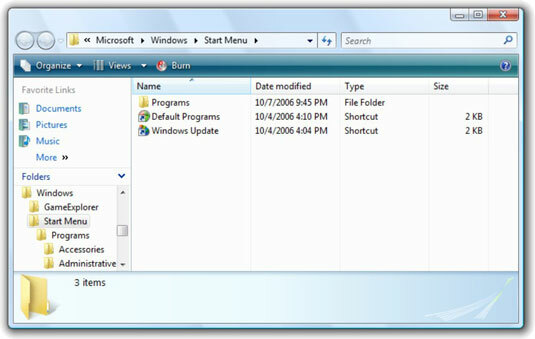 In the following figure, you can see the contents of a very simple ProgramDataMicrosoftWindowsStart Menu folder. One level down, in ProgramDataMicrosoftWindowsStart MenuPrograms, though, things start getting complicated. Microsoft put its advertisement — er, its shortcut for the Windows Live Messenger download — in the folder. Office 2007 puts a folder in there, too. 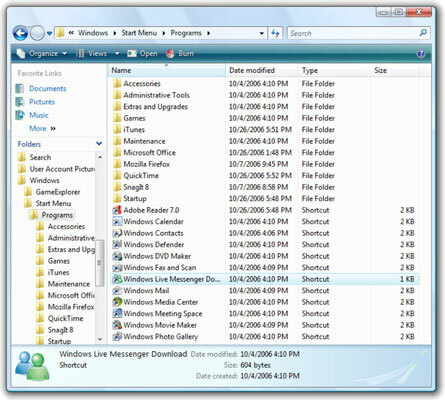 Duangkhae’s Start Menu folder is empty except for a Programs folder, but her C:Users<username>AppDataRoamingMicrosoftWindowsStart MenuPrograms folder looks like the following figure — a typical bare-bones Programs folder in Vista. When Duangkhae chooses Start→All Programs, Windows combines those three folders (plus Duangkhae’s Start Menu, which is empty) to produce the All Programs menu you see in the following figure. All the individual items appear in alphabetical order above the folders. Folders turn into submenus. 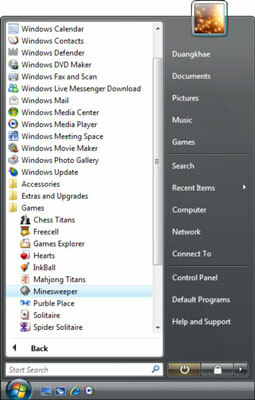 For example, the C:ProgramDataMicrosoftWindowsStart MenuProgramsGames folder in the previous figure becomes the Games collapsible folder in the following figure. Windows Live Messenger Download from the All Users Programs folder turns into the Windows Live Messenger Download item on the menu. Duangkhae’s Start MenuProgramsWindows Media Player shortcut turns into the Windows Media Player item on the All Programs menu. Although it’s certainly good for Microsoft’s bottom line to put Windows Live Messenger Download and the gosh-spend-more-money-with-Microsoft Extras and Upgrades folder in your face every time you choose Start→All Programs, there’s no reason in the world why you should have to wade through all that garbage when you’re trying to get some work done. Taking some time to organize and clean up these folders to make things easier to find on your All Programs submenu can really pay off in the long run.